The aim. To evaluate the tolerance young athletes have to two knee protectors, using different types of articulated joints: the KTJ© articulated joint with a variable rotation centre and the double centre articulated joint. The models. 8 males and 2 females (footballers) took the test in two stages: the first stage was carried out with four exercises, where they wore only one knee protector, first one type then the other, choosing randomly; in the second stage they had to complete 10 exercises, with both knee protectors worn at the same time. The evaluation method. At the end of each exercise, the models were asked to indicate, on a scale of 1 to 10, any feelings of discomfort they had had, the mobilisation of the protector, any limitations of movement they experienced during the test and how many times they had had to re-position the knee protector manually. 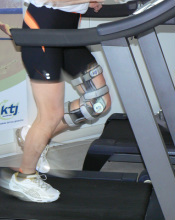 The positive tolerance (+25.9%) of the knee pad using a KTJ© articulated knee joint compared to the knee pad using an articulated knee joint with a double centre, reflects on a personal level what has already been found from previous studies. These showed the transmission of minimum and balanced tensions on the cruciate ligaments by the KTJ© articulated joint with variable rotation centre during knee movements and the harmony of the rotational-translatory motion with the real trajectory of the knee which the KTJ© articulated joint gives. This harmony is not verifiable with the double centre articulated joint which is the one found in most protectors on the market.